Precious metals expert Michael Ballanger discusses the most recent gold COT report and movements in the market. 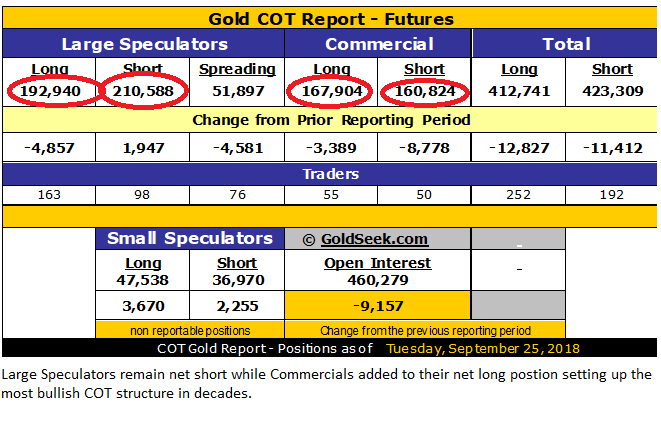 Once again the COT report from last Tuesday has revealed continued pressure on the already taut firing pins of the gold and silver markets with more shorts added by the Large Spec algobots and more longs/fewer shorts reported by the Commercials largely represented by the bullion banks. If it is the gold cartel that has capped rallies in the $1,350-1,375 range since August 2016, it is that same gold cartel that are actually positioned for a rally today and where the market is baffling everyone is the failure of the Crimex Criminals to launch the rally. The answer lies in the ascent of the machines in dictating direction in any and all markets. Whereas the algos have been focused on all things non-metal in recent years, they have taken to the gold and silver markets lately and are displaying phenomenal power and control in thwarting the intentions of the bullion bank cartel. My new line of speculation has at its core the notion that the intervention "end-game" for the big players in the gold arena may involve developing an algorithm of their own to combat the power of the banks in controlling price. To be more specific, if the algos can take the market down and force capitulation amongst the bullion banks, who are now long gold for the first time since 2001, it would be somewhat of a pyrrhic victory of sorts. To achieve victory over the always-right bullion bank behemoths by taking price DOWN may be the ideal set-up for the inevitable rally that we all expect is long overdue. Perhaps in breaking the stranglehold of the Commercial Cretins on the downside, they will clear the path to $1,400-plus by way of burning the invisible hands of intervention and searing the memory of blistering financial pain in the same way that the cat avoids the stovetop in ancient folklore. Before you all ask the point in the week where the locks came of the booze box and medicine chest, I must confess that self-medication and auto-sedative behaviors have reached the point of necessity in this logic-starved environment for precious metals investing. To wit, this has been a BRUTAL year for gold speculators and worse than 2015 in many respects despite prices being higher than that point in time. Sure, the COT structure looks terrific as sentiment continues at extremes not seen since the late 1990s but what traders want to see is a trend that lasts longer than a few hours (or minutes) and that is something that has been largely non-existent for the better part of the year. Unlike 2016, when gold experienced a vicious reversal just below $1,050 based upon the whims of the Commercials, gold absolutely refuses to yield to them in this go-around and my position is that until I can see evidence that the have either won control or have capitulated, I remain sidelined in terms of the Gold Miner ETFs or further options or futures positioning. 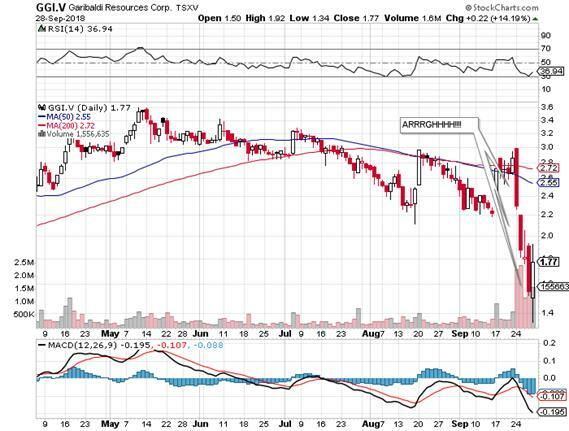 The Novo Resources Corp. (NVO:TSX.V; NSRPF:OTCQX) story, which I wrote about at $7.00 a few months back, has now joined Garibaldi Resources Corp. (GGI:TSX.V) as the new "Scam of the Month" member as the Denver Gold Show presentation underwhelmed audiences, the bulk of whom were obviously NVO shareholder in need of some hand-holding. GGI was hit with a large dose of assay result reality after a really dubious series of delays and once the company reported results that were less than half as impressive in term of grade and even feebler in terms of width as the discovery hole that sent the shares to over $5 in 2017, the share price crashed, closing at $1.77 after getting slammed down to $1.34. Both of these issues have been heavily promoted by a number of very capable and conscientious newsletter writers and one very prominent gold-centric billionaire (during his weekly interviews) but no matter what the story, the new, much-younger wave of investing techno-geeks will have none if it and mercilessly trashed the two former explorco jewels of the Canadian mining scene. Such is the current landscape in the junior exploration world and rightly or wrongly so, it is the "new reality." I think that the new investor generation is far more willing to gamble on eccentric geniuses like Elon Musk, whose Tesla Inc. (TSLA:NASDAQ) is looking more like a John DeLorean Story than a Henry Ford Story. These fuzzy-cheeked, high-IQ'd money managers will chase and pile on and overweight absurd stories like TSLA until they all collectively and simultaneously crash and burn and that's all "no problem" because they can all have a Facebook or Instagram party and cry together when it all comes blazing down. You will note that I have purposely avoided the uranium-vanadium space thus far in this missive but with vanadium pentoxide hitting $22.90/lb in the past week, the last of the battery metals has now absolutely snatched investor interest from the headlocks held previously by cobalt, graphite and lithium. I have written three articles on Western Uranium & Vanadium Corp. (WUC:CSE; WSTRF:OTCQX) since August after I sent out an email in mid-June inviting everyone to join me in buying into the $0.68 per unit financing that is now ahead 266% since the August 9 closing. If you add the half-warrant at $1.15, the unit is up 460% and that is worthy of mention, especially since the last few gold and silver deals I have played have been unexciting at best. 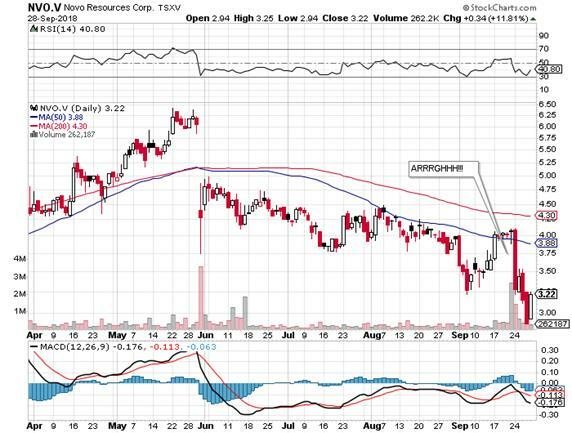 With WUC now sporting an RSI above 70, a few of the followers have asked if it due for a correction but I would point to two earlier RSI spikes that happened in August at $1.60 and two weeks ago at $2.00, which resulted in the blast-off last week to the multi-year high at $2.77. What you have to remember is that we have an underlying commodity-price reversal after over 10 years of pain, particularly in uranium, which makes this the embryonic stages of the new bull market in uranium, and since China's lawmakers have forced new minimums for the hardness of steel in their construction business, China is now a net importer rather than exporter of vanadium pentoxide. To say that vanadium has now entered into a "tight market" is an understatement, which puts WUC's 35 million pounds located within the U.S. continental mainland into a new league. The silver market had a good week versus as did the miners so I would hope gold and the entire complex will catch a bid shortly and as I have chortled animatedly for the last year, when it finally happens, silver and gold investors will finally be able to crawl out if their hiding places to replace the Tesla-dytes and offer them their warm and cuddly crawl spaces.